On our previous trip to Sri Lanka we only touched base (quite literally) at Dambulla without going up to see the cave temples. 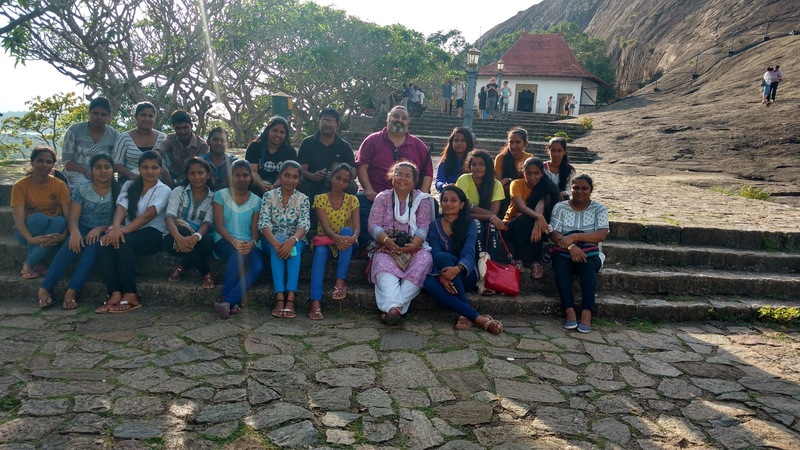 This time we made it to the top along with our enthusiastic bunch of students from the University of Kelaniya. It's an approximately four hour drive from Colombo, a scenic drive through hills and plains and plenty of lush greenery, small towns, bustling markets, and plenty of Buddhist dagobas too. Most restaurants have exceptionally clean washrooms making the long drive quite stress free. This complex of cave temples is part of a living Buddhist monastery - the longest known actively used Buddhist monastery. At the base of the site is the Golden temple with an enormous seated Buddha image. 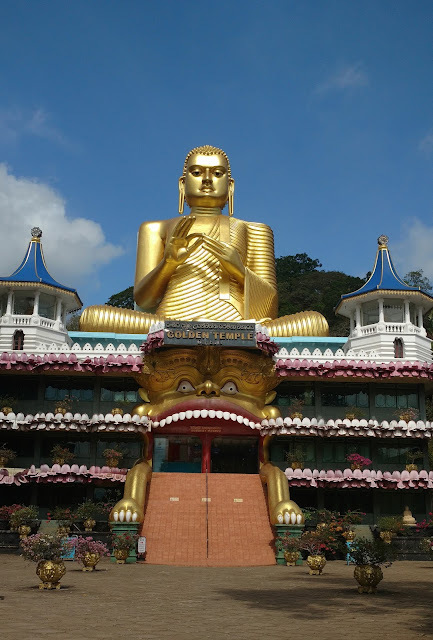 This is one of the most dazzling sights in Sri Lanka - the huge temple with that massive image of lord Buddha seated atop against a clear blue sky. The ancient painted caves are far above this spectacular looking temple and it's quite a climb up to get to them. Dambulla is not a site for handicapped visitors or for those who have difficulty walking or climbing. You can either take the winding paved pathways or the stone stairs. There are numerous places to stop and rest as you climb. The hubby was determined to get up there so we went up really slowly taking many breaks. We found the stairs easier than the winding paths going up. Be sure to carry drinking water with you, climbing is thirsty work and there aren't any stalls selling water/soft drinks or cheap knickknacks here. Wear dark glasses and a cap, the glare of the Sun can be quite sharp. You can drive up to a certain distance reducing the climbing by about 50%. Ask for directions at the ticket counter while buying your tickets. Like with most active temples in Sri Lanka you have to remove your footwear before entering the temple complex at the top. Carry socks as the rock floor can get quite painfully hot. You will also have to buy a separate pass for your camera (not for the phone camera). The climb is scenic and the views around as you get higher are quite spectacular. You will encounter troops of mischievous toque macaques as you climb. They are quite comfortable around humans and we saw one grab food from a passing tourist, so keep food out of sight to avoid thievery! 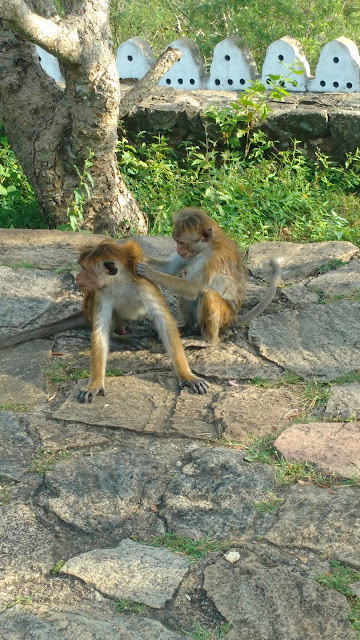 I could easily spend a couple of hours watching these macaques and shooting endless photos! I did manage to tear myself away and eventually make it to the top, to the cave temples. There are five caves in the complex at the top, each with numerous Buddha statues interspersed with a few figures of kings and of other divinities. There are paintings on practically every surface except the floors. What I really liked is that the caves are softly lit inside so one can see the interiors quite easily. 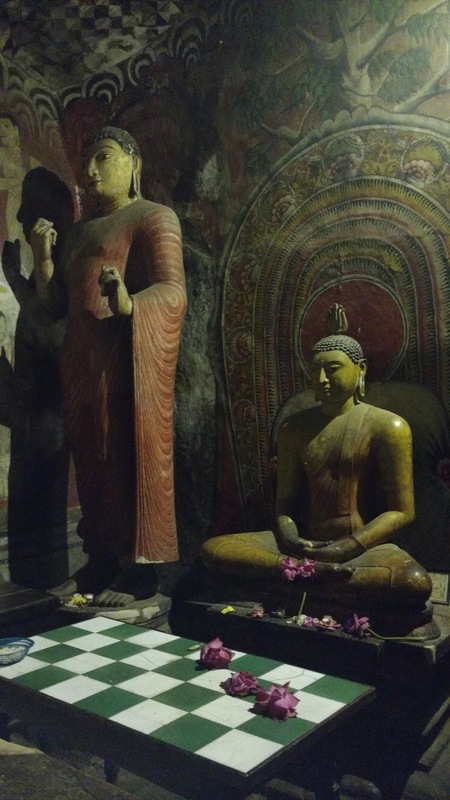 A seated Buddha and standing figure of Ananda, his favourite disciple in the first cave. 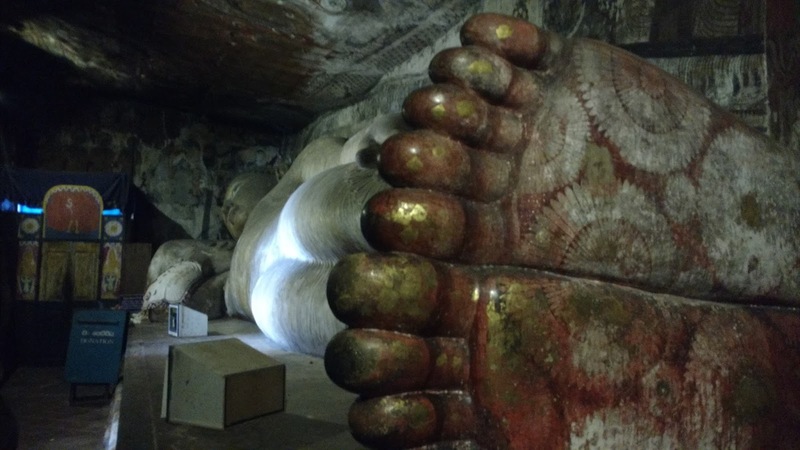 The first cave houses a large image of the Buddha in the reclining mahaparinirvana pose with a couple of other images at its feet, one of which is of Ananda, his favourite disciple. 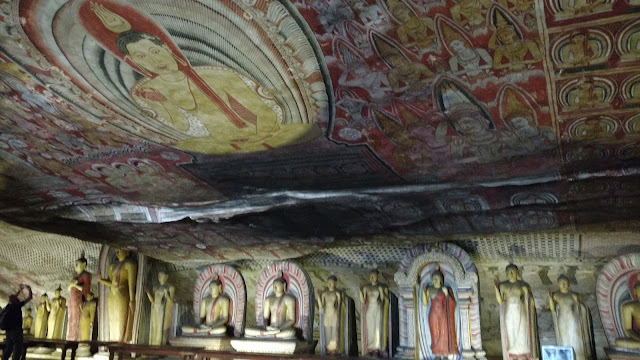 The walls and ceiling are covered in painted decorations depicting devotees, bhikshus, and legends from the Buddhist texts. Even though its a small cramped cave it is still quite awe-inspiring! 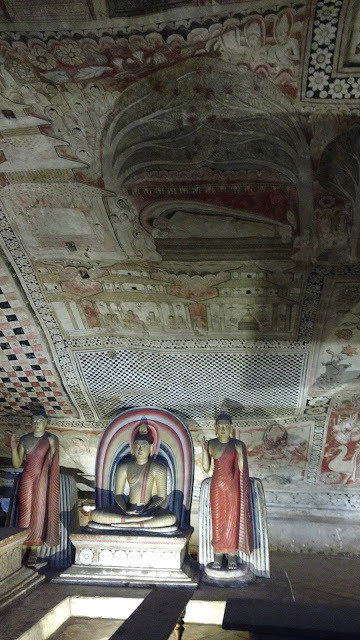 The next two caves are quite vast and are full of Buddha images in standing and seated poses, and in the reclining pose too. These caves also have images of patron kings, and the gods Vishnu and Saman, and stupas. The frescoes depict Buddhist legends, episodes from his life, and animal, bird, geometric, and floral motifs. Like I said earlier, every square centimetre of the interiors of the caves is painted and the sight is simply spectacular. The last two caves are not as large but are as heavily decorated. The mahaparinirvana Buddha depicted on the ceiling. The detail is simply incredible! Keep a day for Dambulla. The temple at the base, the climb to the cave complex at the top, and then the cave complex itself will require time. Once you're done with this site you can have a quick look at the market on your way out. The sheer variety of fruit and vegetables will leave you impressed. Read about my visit to the Dambulla market here. On the climb down we caught a glimpse of the Lion Rock, Sigiriya as the skies were clear. What a thrill to see that incredible landmark from so many kilometres away!